*The following food review was written by my good friend Sandor Mark, a writer and fellow gourmet foodie. Photos taken by yours truly. Enjoy! You may have never heard of Zocalo restaurant, but if you’ve ever walked far enough down Clarendon Street, you may have turned your head down a certain alley that overlooks I-90. Wander far enough down those alleys, toward the one or two Mercedes parked in front of a valet stand and you’ll find yourself outside of a traditional looking Mexican restaurant. With the bright tiling on the walls, first impressions of Zocalo may suggest it is the just another typical Mexican restaurant. Thankfully first impressions aren’t everything. 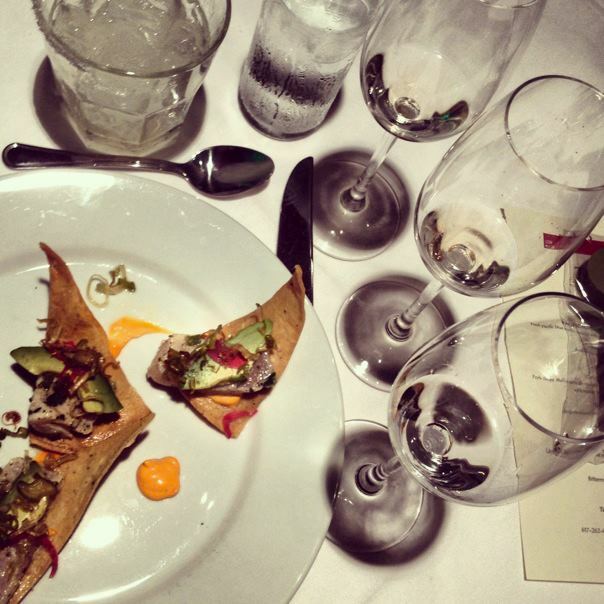 Last Wednesday night, Zocalo Cocina Mexicana hosted a Tequila tasting dinner alongside Tanteo tequila. The dinner featured the culinary skill of Chef Ramos as he created a three courses to compliment the three different infused Tanteo tequilas: Jalapeño, Cocoa, and Tropical. When our group arrived at the restaurant, we were taken down into Zocalo’s basement dining room. Far from the tiled décor upstairs, Zocalo’s basement dining room looked more like a nightclub than a Mexican restaurant. The color changing mood lights, Pandora radio playing in the background, and the fully stocked bar was everything one could ask for when trying out new tequila. What makes Tanteo special is that it's infused tequila. Jacob Gordon, a rep from Tanteo explained that it is different from flavored because “flavored liquors are made with syrups and chemicals, whereas Tanteo is infused with all natural ingredients.” Surely enough, if you go on their website, you’ll see pictures of the Tequila being made with fresh jalapenos and cocoa beans. What’s amazing to me is the pepper infusion makes the tequila spicy; nothing unbearable, but just enough heat to add an extra layer to the complexity to Tanteo’s flavor. On our tables were three small wine glasses of Tanteo tequila. For college students, dusting the bottom of glass with a drop of Tequila is hardly enough. We all had our eyes on the many bottles of Tequila on the bar—to look at, but not to touch. It wasn’t long until we began joking, “Excuse me, I’m going to need to be topped off.” We sniffed and examined the Tequila’s in front of us, waiting for someone to give us instructions. My friend turned to me holding the pink tinged tropical tequila, “That’s got way more alcohol than the others,” he said. When we actually tried them, we were surprised by the lack of harsh aftertaste. It turns out the jalapeno’s heat balances out the tequila’s sweetness” Then when we tried the tropical infusion, four layers of flavor emerged. “You’ll find that the flavors come in waves starting with the mango and ending with bread fruit,” said Gordon. The flavors only became more complex as the night progressed. Along with the uniquely crafted food, Jenn Harvey, a mixologist at Zocalo, created special cocktails to compliment each course. “Each of these dishes and cocktails are designed to celebrate the flavors and traditions of Mexico,” explained Jacob Gordon. Both Chef Ramos and Harvey dazzled and delighted us with each course. Too often we go to fine dining establishments and find food that has become a grotesque display. Because of elaborate plating and difficult styles of cooking, fine dining has become more visual art than sensory pleasure. Chef Ramos’ culinary skill was both sumptuous and artfully arranged, serving as a reminder that a decadent and luxurious meal can also be satisfying. But what made the meal all the better were the three delicious cocktail pairings. Jenn’s mixologist skills brought an equal amount of innovation, imagination and flavor to the meal. Using Tanteo tequila, Jenn created three different cocktails to compliment the food. Starting with Tanteo’s original, Jalapeno infused tequila, Jenn created a new twist on the classic margarita. Mixed with fresh limejuice and orange liquor, the first cocktail was paired with blue marlin tostadas and a cold beef salad called salpicon. The first course of food and drink was refreshing and exciting, giving us the kick we needed to wake up our taste buds. Now that both chef and mixologist had our attention, they brought the timbre down. For our second course, Jenn created an amber colored concoction using the Cocoa infused tequila, chipotle infused sweet vermouth and amontillado sherry. Matched with a pork chop stuffed with apples and chorizo sausage, the drink was as velvety decadent as the mashed potatoes served alongside our chops. The cocktail and food all felt so luxurious. The flavors and alcohol created an intoxicating calm that can only be found in dimly lit parlors and smoke filled drawing rooms. 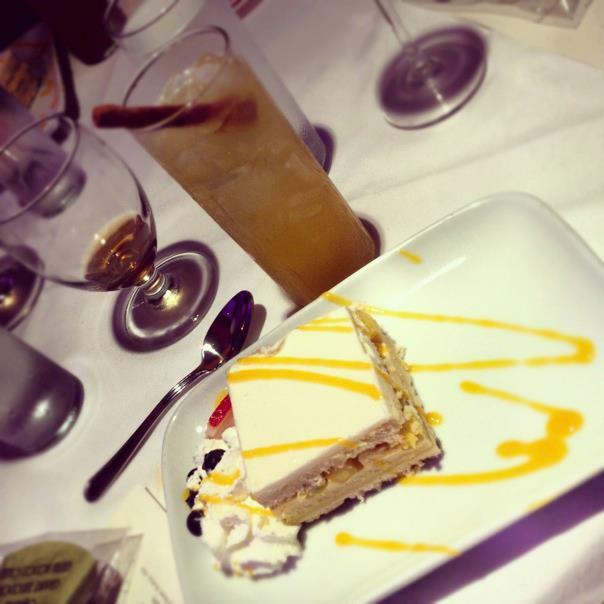 For dessert, Ramos created a tres leches de Mango cake, served with a refreshing summer drink, made from the tropical infused tequila, biter hiver and Jarrito’s mango. For a moment we could have forgotten it was rainy and dark outside. Down in the basement it was like the sun was setting on Cancun and we were putting our feet up after a hot day. Tanteo may be a newcomer to the Tequila industry, but when mixed adequately, its sophistication and potential wit makes it a complex brand of Tequila. It certainly blows other brands like Patron and Jose Cuervo out of the water, not necessarily because it’s better tequila, but because it’s tequila with imagination and class; something that most tequila’s aren’t known for. At the moment, the only place in Boston selling Tanteo is Bauer Spirits & Wine on Newbury Street, but hopefully it will gain the notoriety it most definitely deserves.